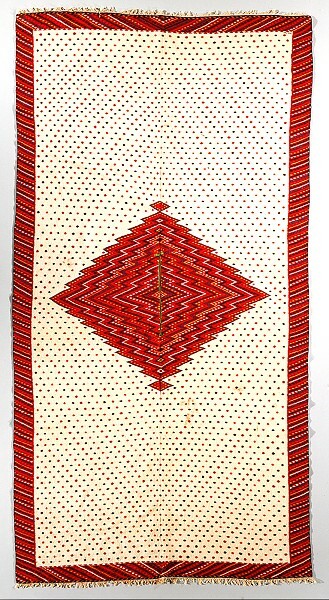 The creation of Saltillo-style textiles is attributed to the Tlaxcalans, indigenous people of central Mexico. Before Spanish contact in 1519, the Tlaxcalans wove sophisticated textiles on backstrap looms, relying on cotton and other plant fibers for their raw materials. Soon after contact, they began producing equally outstanding textiles using wool and treadle looms adopted from the Spanish. In 1521, the Tlaxcalans and Spanish defeated their common enemy, the Aztecs. In return, the Spanish awarded the Tlaxcalans special rights and privileges, and the Tlaxcalans supported Spanish efforts to integrate Indians farther north into the colonial system. By the late 16th century, they had established colonies as far north as New Mexico. Perhaps the most famous of these colonies was San Esteban de Nueva Tlaxcala, founded in 1591 near Saltillo, today's capital of the Mexican state of Coahuila. San Esteban soon became a major center of woolen textile production and, according to most scholars, the place where the Tlaxcalans developed the new weaving style known as Saltillo.